One of the freshest and deepest techno bits from Holland, Eevonext has an exciting debut from a talented Dutchman. Klaas-Jan Jongsma aka The Moderator is from Almelo, a small town from Netherlands. 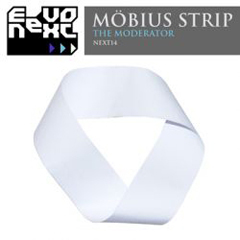 He is a very talented producer and for sure Eindhoven's Eevonext is very proud to release The Moderators' debut. Lot's of Detroit influence and synth oriented madness. His sound is the finest blend of Den Haag or Rotterdam style electro with Detroit. Melody level is real high and we mostly deal with faster bpms as well. The Moderator really loves electro and break beats. There is no 4/4 track in the "Möbius Strip" album. Made up of 12 tracks, "Möbius Strip" gives a whole definition about contemporary reflections of proto electro-techno. A real harmonic journey fused with basslines and arpeggiated leads. "Ultrasound" which is my most favorite in the LP is like a summary to the whole debut. Such a strong track. KJ Jongsma has done a great job in his debut. Eevonext keeps on it's musical acceleration. I think they will be one of the deepest and most influeantial and original labels in the Netherlands.